At Barista Del Caffe, we share your passion for great coffee. Just like you, we want to enjoy the best possible coffee at home. That’s why we created this website. We know that sometimes, you want a great cup of coffee without any fuss. The easiest way to achieve that is with a coffee pod machine. So we created this guide to help you find the coffee pod machine that’s perfect for you and your home. For those times that you want a coffee without all the preparation or cleaning associated with other coffee making methods, the coffee pod machine has to be the ideal solution. In most cases you can go from switch on to great cup of coffee in less than ninety seconds. Then simply dispose of the pod, with no washing or cleaning. With many coming in at less than £150, coffee pod machines are also an inexpensive way of getting good quality coffee at home. There are so many options on the market, that choosing the perfect one for you can feel overwhelming. Here at Barista Del Caffe, we’ve created this handy guide that’ll help you choose the perfect machine for you. What’s in our coffee pod machine guide? Every coffee lover takes their coffee slightly differently. But whatever your preference, we know that you want to be enjoying a cup of coffee that hits that caffeine spot. That’s why we’ve created this handy guide to the top coffee pod machines in the market. All of the machines we review come from only the most reputable and well-recognised brands, so you can be sure of quality and reliability. You can trust that each machine we review produces coffee you’ll love as standard. So the differences we talk about are the range of coffees, the ease of use, functionality, advanced features, ease of maintenance, and what real users think of their machines. However, while we would – and do – recommend every one of the machines included in this list, it doesn’t mean that every machine is right for you. Your preferred coffee type, functionality, and budget all play a part in making sure you choose the perfect coffee pod machine for your home. While budget is a consideration for most of us, the relatively inexpensive cost of a coffee pod machine means that most of these on this list are within the reach of most people. The cost indication below reflects whereabouts each machine sits in comparison to the cost of other machines and without any discounts. Combine two great brands, and what do you get? 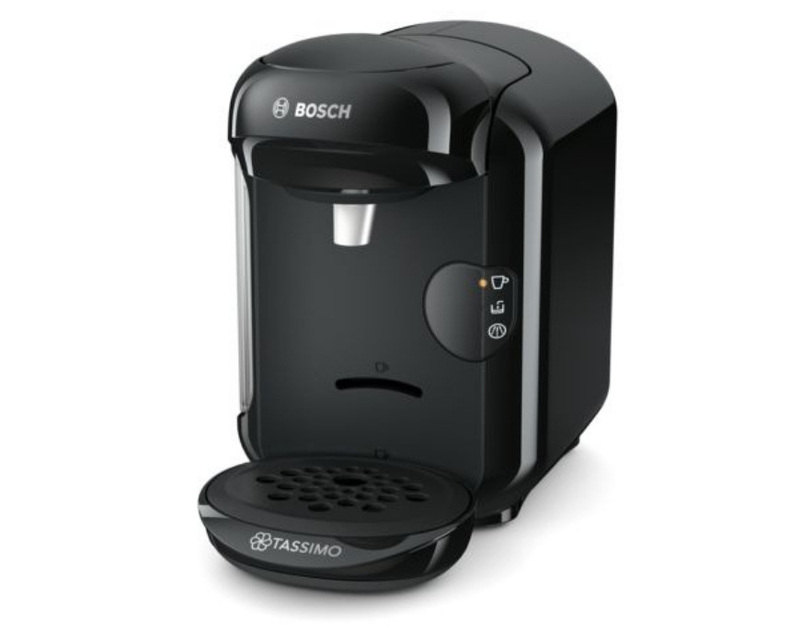 A coffee pod machine as good as the Bosch Tassimo Suny TAS3202GB. With an impressive 4.4 star rating on Amazon and other sites, it regularly appears on the best buy coffee pod machine lists. 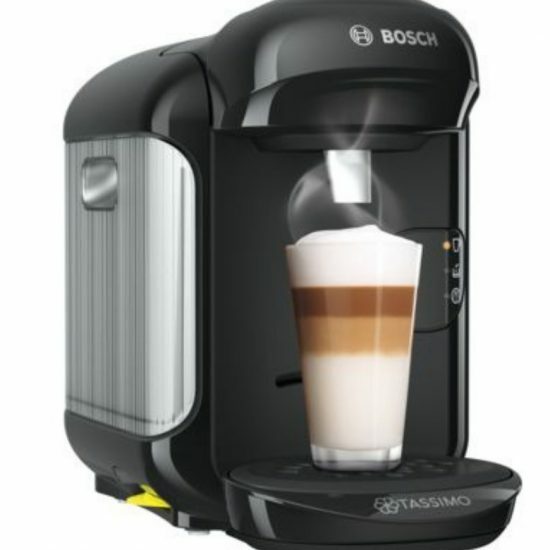 If you’re a speed demon when it comes to coffee, then the Bosch Tassimo Suny TAS3202GB is the machine for you. Described by Tassimo as ‘the quick one’, it’s a well-deserved title. The innovative INTELLIBREW™ heater technology heats the water to optimal temperature in just 27 seconds. Fancy an espresso? You’ll be enjoying it in another twenty seconds. Perfect for those who need a fast caffeine hit. Tassimo produces over forty different drinks for this model. From coffee to fruit teas to chai latte, you’ll find something to suit your mood. And the barcode system used on every pod means that every cup is delivered to perfection. However, if you prefer a longer drink than it serves as standard, you can easily top up the water using the manual button on the side. Although there’s a wide choice of drinks available, be aware that you can’t use any other pods in Tassimo machines. The simple answer? Really easy. You don’t even need to turn it on. Simply touch the front with your favourite cup and it turns on. Pop in a pod, press the start button, and it’s off. This model features just three LED indicator lights which tell you everything you need to know, from water level to descaling, and just one button that does everything you need. Cleaning this coffee pod machine is easy, as it runs an automatic descaling and cleaning programme that’s operated by putting the T-Disc into the pod holder. However, the cleaning programme does take around two hours to run completely, during which time you’ll need to fill it four times. There are very few. One criticism is that it’s noisy, but with coffee served that rapidly, it’s really only the cleaning process where it’s an issue. The manual is described by some as indecipherable, but this machine is so easy to use, that shouldn’t be a problem. For those looking for a coffee pod machine that’s fast and simple to use, there’s really nothing not to like about the Bosch Tassimo Suny TAS3202GB. From cold to cup, you can enjoy an espresso in less than a minute, with a wide range of drinks available. The only and very minor issues are that it’s a little noisy and the cleaning cycle is rather lengthy. Looking for more information on the Bosch Tassimo Suny TAS3202GB? With both Bosch and Tassimo recognised for quality in their respective fields, it shouldn’t be surprising that the Bosch Tassimo Vivy 2 makes regular appearances in the best buy lists for coffee pod machines. Thanks to its highly competitive price point, it combines great value with great quality. A coffee pod machine should produce a great cup of coffee with the press of a button, and that’s what this machine delivers. It has a simple user interface that clearly indicates its status, making it easy to use once set up. Its INTELLBREW™ system heats the water in no time, while brewing takes less than a minute. Just pop in a disc and you’ll be enjoying your favourite brew in no time. 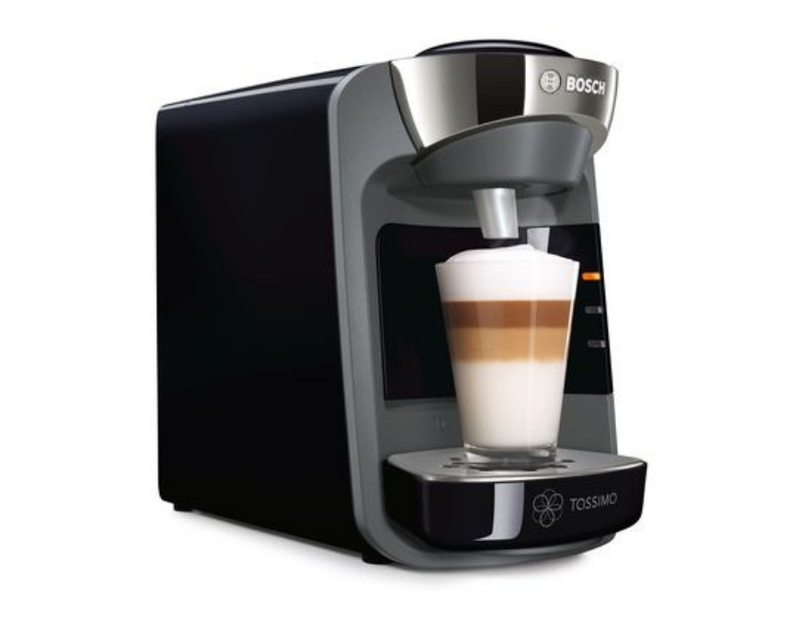 The Tassimo range boasts over forty different drink types available for this model. Not only can you make a decent espresso, cappuccino, and latte macchiato, but also hot chocolate and tea. The patented barcode system allows the machine to know exactly what drink you want and deliver the perfect volume, strength and temperature. The manual button lets you top up the water if you prefer a longer drink. Just note that you can only use Tassimo pods in Tassimo machines, meaning that you’re limited to their options. Very easy. There’s just one button, which does everything you need. And a five light LED system keeps you fully informed about its status at all times. The INTELLBREW™ system ensures a great cup of coffee every time. Cleaning this machine is easy, as it runs an automatic descaling and cleaning programme that’s operated by popping in the T-Disc that lets the machine know what to do. However, it needs cleaning before it can be used. And not only do the manufacturers suggest waiting 24 hours before operating it, but many users describe the picture-only manual as indecipherable. You might need to hop online to find a how-to video to figure it out. Overall, it’s easy to see why the Bosch Tassimo Vivy 2 regularly features on the best buy lists. It offers a quality coffee pod machine at a great price. Plus its sleek, stylish design and small footprint means that it’s a great addition to any coffee lover’s kitchen. Looking for more information on the Bosch Tassimo Vivy 2? When you get the renowned coffee producer Nescafe joining forces with renowned coffee machine maker De’Longhi then you shouldn’t be surprised that the Nescafé Dolce Gusto by De’Longhi Jovia EDG250B is a regular appearance in the best buy coffee pod machine lists… Boasting a 4.4-star rating on Amazon and other retail sites, it’s one of most popular coffee pod machines around. This model takes a reasonably fast forty seconds to reach brewing temperature. The speed of the brewing process depends upon the type of coffee you choose and your preferred length and strength. As this machine can produce cold water as well as hot, and with over forty drink types available, there’s something for everyone. With a professional 15 bar water pressure, it produces a good espresso, with a rich crema. And the nice people at Nescafe send a pack of six sample pods for you to get started straight away. 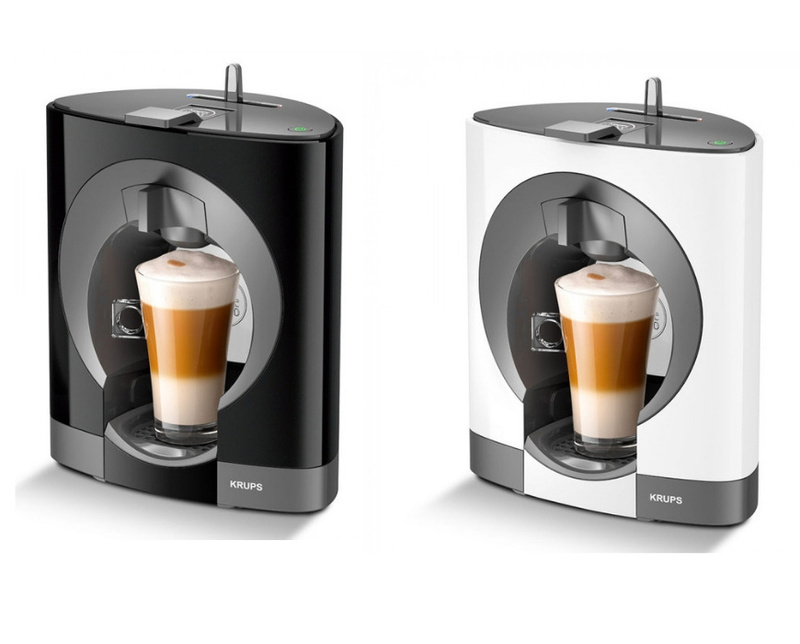 If milky coffees are your thing, this Dolce Gusto model produces a reasonable froth from the milk pods. However, the milk tends to be on the sweet side, and some describe the taste as artificial. Just be aware that not even other Nescafe or De’Longhi pods work in this machine. It will only take the specifically designed pods. The Nescafé Dolce Gusto by De’Longhi Jovia EDG250B is sleek, stylish and futuristic looking. The simple design, with just one button, one lever, and one LED indicator light, makes it easy for users to know exactly what’s going on. Potential purchasers should know that this isn’t a press and forget machine. It’s up to the coffee lover to decide how hot, long and strong they want their drink, using the lever on top. Despite the indicator on top of the pods, it can take a while to master the perfect brew. Cleaning this machine is time consuming. There’s no automated cleaning programme, so you’re very involved in the process. However, the initial clean before it’s first use is pretty simple and straightforward, and the manual is easy to understand. Combine recognised names from the coffee and the coffee machine markets, and it’s not surprising that you get a machine that’s highly rated. It offers an unusual amount of controllability for a coffee pod machine, and alongside the usual hot drink options, there’s a range of cold drinks available too. 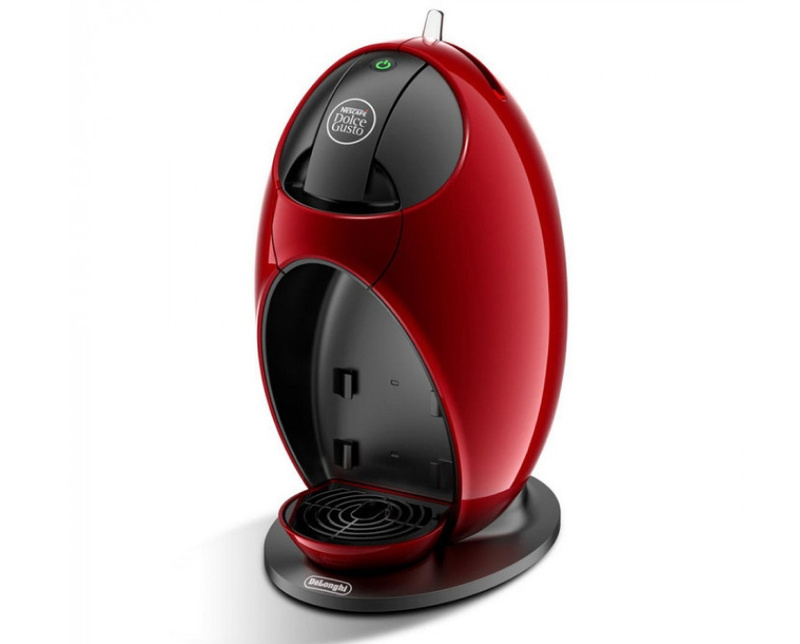 Looking for more information on the Nescafé Dolce Gusto By De’Longhi Jovia EDG250B? 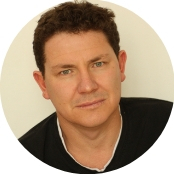 What happens when you combine the Nescafe Dolce Gusto brand with the Krups brand? Well, apparently, a coffee pod machine that wouldn’t look out of place in the space age. The Nescafe Dolce Gusto Oblo By Krups is the ultra modern, ultra stylish coffee machine that also delivers a great cup of coffee. This machine uses a thermoblock system to heat up in a perfectly respectable forty seconds, with a green light indicating when it’s ready to go. The brewing process time is dependent upon the coffee you choose, and how you prefer to take ti. This Dolce Gusto model has a professional level 15 bar water pressure that produces a good, thick, luxurious crema on espresso type coffees. The cold water option combined with over thirty different pod types means that there’ll be something for everyone’s taste. Be aware that some users report that the water doesn’t get hot enough for their tastes, even on the highest temperature setting. It’s supplied with eight pods to get you started straight away. 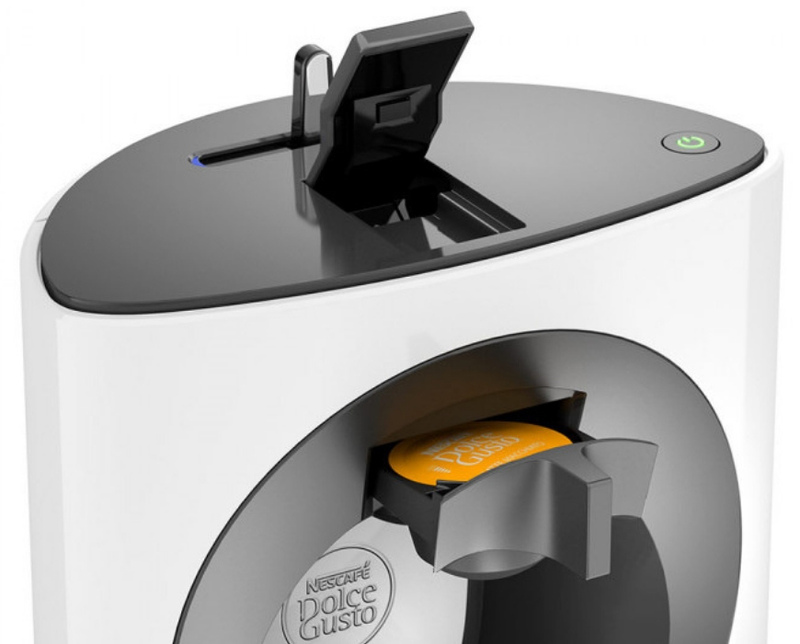 As with most brands, only Dolce Gusto pods work in this machine, even though Nescafe produces other coffee pod machine types. For milky coffee lovers, the branded milk pods has been criticised for being over-sweet and somewhat artificial in taste. Looks-wise there’s little to beat the Nescafe Dolce Gusto Oblo By Krups. It’s up-to-the-minute sleek, elegant design is a stylish addition to any home. It features just one button, one light, and one lever, for ease of use. This model comes in a range of colours to fit your kitchen decor. But, whichever colour you choose, the cable and plug are both red. While it’s design is simple, the fact that it’s up to the user to add the amount of water to their drinks make it a little more tricky to use than single button press machines. Users report that while making black coffees is fairly straightforward to get right, making great coffees with milk is much harder. That’s because, despite the bar system on the pod lids, it’s hard to get the proportions right. Be prepared for some questionable results while you get used to the process. The machine doesn’t come with an automated descaling programme, but it’s pretty quick and easy to clean. The initial clean is also simple to perform, and the manual has clear instructions. If looks are just as important to you as coffee, then the Nescafe Dolce Gusto Oblo By Krups is the obvious choice. It also offers a high level of controllability for those who prefer to take charge. Whether you prefer hot or cold drinks, you’re sure to find something you love from their extensive range of drinks. However, if you want a machine that does it all with minimum intervention, this isn’t the machine for you. Until you master the art of the water, be prepared for some questionable results early on. Looking for more information on the Nescafe Dolce Gusto Oblo By Krups? Nespresso is a well-known brand in the coffee pod machine market, partly thanks to the clever use of George Clooney. Described as their entry-level option, the Nespresso Inissia by Krups is punching above its weight as it takes on much more expensive machines in the best buy lists. Boasting a laudable 4.5 stars on Amazon, combined with its inexpensive price tag, it’s a popular choice. This Nespresso is ideal for coffee fanatics who want an ultra-speedy caffeine hit. It takes just 25 seconds from switch on to ready to go. The brewing process takes around a minute. This machine produces great black coffees. With an impressive 19 bar water pressure, it produces an espresso with a rich, velvety crema. And your lovely new machine comes with a generous sixteen pods to get you started on your Nespresso journey. However, black coffee is all the Innissia produces. It offers a range of just 22 grand crus coffee types, with no milk options available. If you prefer a milky coffee, you’ll need to invest in a milk frother. On the plus side, you can buy compatible pods, so you’re not tied to Nespresso prices. This machine is tiny, measuring just 12cm x 32.1cm x 23cm. The simple design, with just two buttons is easy to use. Looks wise, despite being plastic, it looks good quality, although some people don’t like its appearance thanks to its large pod holder handle. Very easy. Press either the espresso or luongo button to turn it on. Press the relevant button to choose one. If you prefer a different volume, simply hold down the button until it has dispensed the required amount, then let go. It’ll remember your preference for next time. However, you might want to steer clear of the manual, which only has pictorial instructions. Some users report that it’s confusing rather than helpful. And the Nespresso Inissia by Krups is reported to be very noisy. Cleaning is simple too. Just add descaler to the water tank, run through twice, then repeat with clean water. But, be aware that Nespresso recommends that you run a cup of water through the Nespresso Inissia by Krups after every use. 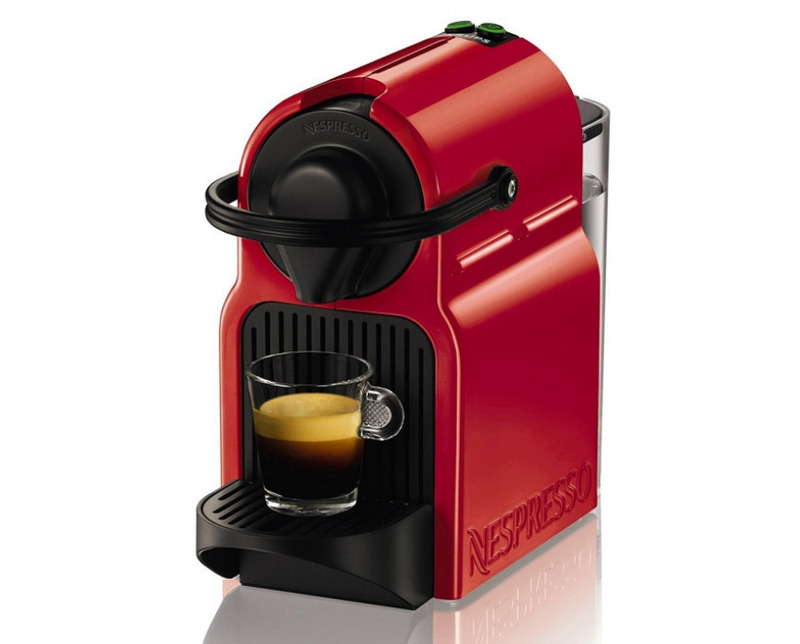 Nespresso is a high profile name in the coffee pod machine market. It shouldn’t be a surprise that even their entry level machines are hitting the best buy lists. This is very much an entry level machine making, as it does, only black coffee. If you want a coffee pod machine that delivers a great cup of coffee (thanks to its impressive 19 bar water pressure) at an inexpensive price then this is for you. If you want a no-fuss cappuccino, latte or other milky coffee, then you’ll need to look elsewhere. Looking for more information on the Nespresso Inissia By Krups? Why buy a coffee pod machine? If you’re an absolute coffee purist, then a coffee pod machine may not be for you. However, if you’re willing to compromise your principles just a little, and if you’re looking for a fast, no-fuss, no-mess, no clean up way to get your daily coffee, then a coffee pod or capsule machine is absolutely ideal. In most cases (although not all), you just pop the pod in, press a button, and voila! You have coffee. And it’s very good coffee too. Clean up is simply a matter of disposing of the pod. And you’re done. Nothing easier! And if you think variety is the spice of life, coffee pod machines let you change up your drink whenever you like. Many also offer teas and chocolate, and some can even make cold drinks too. Who are the big brands in the coffee pod market? While there are a number of players in the coffee pod market, there are three that are the most well known, and all feature on our recommended list. Nescafe Dolce Gusto machines are typically compact and stylish in design. While some are fully automated, the two featured here have manual controllability. Available with a wide range of pods, which are mostly easily obtainable, they’re perfect for those who enjoy to mix and match their drinks. Probably the best known Nescafe brand, thanks to its adverts that feature George Clooney, the Nespresso offers simple to use design and high quality at an affordable price. Unlike the other coffee pod machines listed here, you can buy compatible pods, which can really cut down the running costs. Ultra simple to use, and ultra versatile thanks to the impressive range of pods available. The Tassimo is probably the leading coffee pod machine when it comes to innovation, with their INTELLIBREW™ system that produces the perfect cup each time. They’re also surprisingly affordable given the technology they include. How much can I expect to pay for a coffee pod machine? Compared to other coffee-making methods, coffee pod machines are pretty inexpensive. Even at full price, you can pick up a decent one for a little over £100, with many cheaper than that. Lots of retailers offer big discounts too, so you can be up and running for much less. As you’ve already seen, most coffee pod machines will only take their own manufacturer’s pods. When choosing your machine, it’s worth considering what coffee and other drink types they offer, and how easy they are to get hold of. 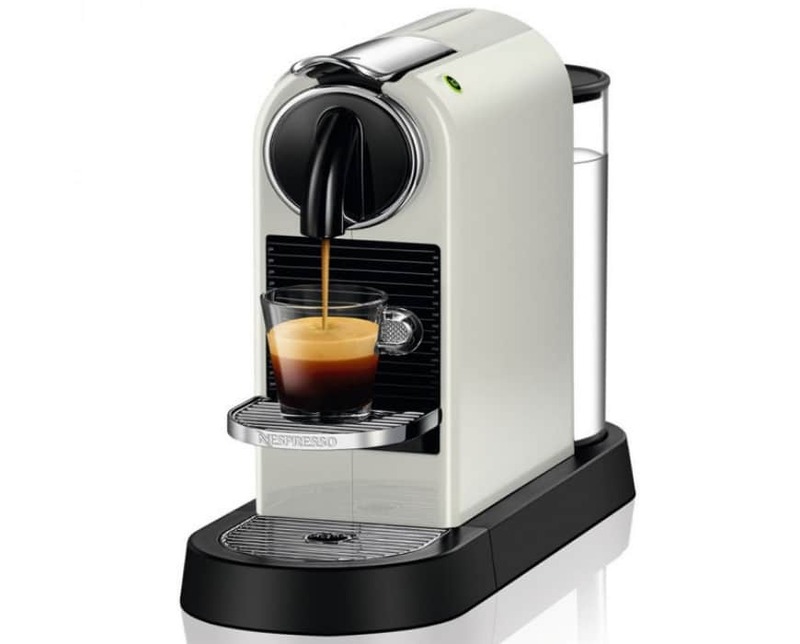 Some machines, such as the Nespresso Inissia, only offer espresso style coffees. Cost of pods is another consideration. While making coffee at home is always cheaper than buying from a coffee shop, the cost of the pods can soon add up, especially if you’re making several cups a day. In most cases, milky coffees need two pods, halving the number of cups you get from a packet. While most coffee pod machines are pretty inexpensive and much of a muchness when it comes to price, you still want to make sure that the machine you invest in does what you want it to do. Otherwise, you’ll end up disappointed with your purchase. So what do you need to consider when choosing your ideal coffee pod machine? Luckily, the relative inexpense of a coffee pod machine means that budget shouldn’t be too much of a consideration when it comes to making a decision. While more expensive machines should offer greater functionality, don’t count on it. Look at machines across the price spectrum and compare their features. You might be surprised. In this digital age, there’s plenty of opportunities to check out what real users of each machine think. While manufacturers and even some professional reviewers will rave about products, it’s worth checking out what real life experiences people have had with their coffee pod machines. Sites like Amazon are the perfect starting place. The one and two-star reviews will highlight the main complaints, ignoring the ones that are just plain ridiculous, of course. Look for common problems. Check out the four and five-star ones too. Much as these people love their machine, they might mention issues such as noise or short cables. A coffee pod machine should be about making great coffee with no fuss – and no skill! But as these reviews show, that’s not always the case. Some make you pour your own coffee, and that’s a skill that takes time to master. Others don’t offer milk options, so you’ll need to invest in a milk frother and learn how to use it if cappuccinos, lattes, or macchiatos are your thing. How easy is to clean? While a coffee pod machine should need minimal cleaning, descaling is still something that needs to be done. It’ll help keep your machine working well, and your coffee tasting great. This is especially true in hard water areas, as coffee pod machines don’t tend to come with water filters. While some coffee pod machines have automated cleaning programmes, some require you to get more involved in the process than perhaps you’d like. Some manufacturers even recommend that you run clear water through your machine after every use. Is that something you’re prepared to do? So what’s your preferred coffee? And how involved do you want to be with the whole brewing process? Some coffee pod machines only make espresso style coffees. Some make a wide range of hot drinks. Some make cold drinks as well. Do you want to press a button and leave your machine to it? Or do you want to control the final product? Do you want to be able to programme your coffee pod machine and have it remember your preferences? Is a longer coffee your preference, so you want the option of ‘topping up’ with water? Or do you want to trust it to deliver a perfect cup of whatever drink you choose with no interference? 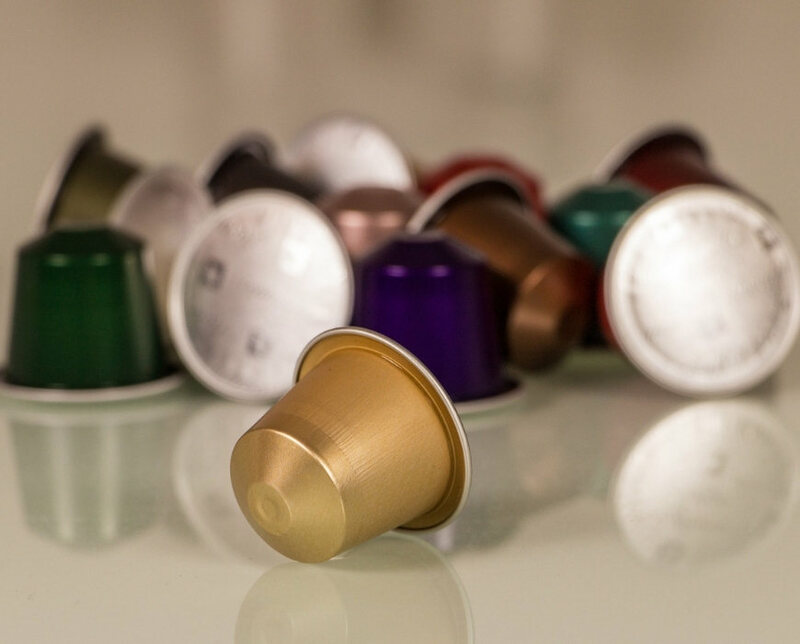 Whatever you’re looking for, there’s a coffee pod machine that meets your requirements. Whichever coffee pod machine you choose, speed is something you can rely on. The difference is quite literally seconds. Can you wait forty seconds for your machine to heat? Or do consider 25 seconds to be the maximum? It’s all down to how quickly you want that caffeine hit. It’s worth noting that no coffee pod machine offers multi-cup brewing. That’s because each pod is designed to make one perfect measure of coffee. If you’ve got multiple coffee fanatics in your home who like to drink together, then this could be a problem, and speed of delivery could be a consideration. While many coffee pod machines make milky coffees, not all do. And all of those brands that do make milky coffees face the same criticism: the milk is too sweet for some, and can taste artificial. If you prefer a milky coffee, and are prepared to put the effort in, it might be worth investing in your own milk frother and adding milk manually for a fresher taste. Water is a key ingredient for coffee. With coffee pod machines, it comes from a water tank, usually located at the back. 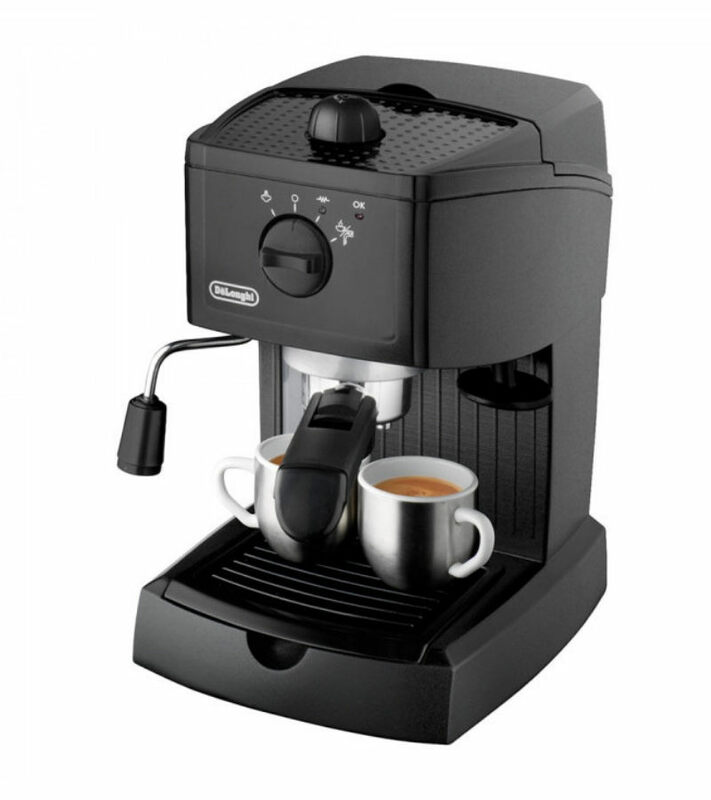 Unlike other coffee machine types, they’re typically small, in the range of 0.7-0.8 litres. Pressure and temperature are key factors in a good cup of coffee. Most coffee pod machines offer a professional level 15 bar water pressure. However, some are lower. Normally, this would be considered an issue. With coffee pod machines, however, it’s not a concern. Each machine is designed to get the best out of its pods. You made it to the end! Hopefully, we at Barista Del Cafe have given you all the information you need to choose the right coffee pod machine for you. Now you’re ready to enjoy the most convenient cup of real coffee you’ve ever had. Enjoy!